October 2018 www.coalage.com 35 corrosion continued IMPACT PLUS users have the option to manage their own use of the product or work with a trained navigator with corro- sion management and consulting exper- tise. 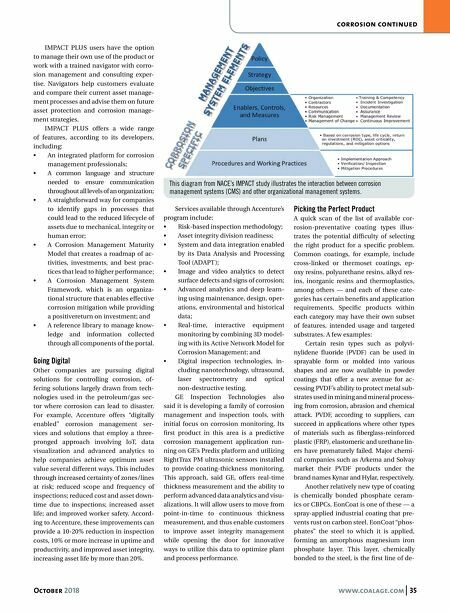 Navigators help customers evaluate and compare their current asset manage- ment processes and advise them on future asset protection and corrosion manage- ment strategies. IMPACT PLUS offers a wide range of features, according to its developers, including: • An integrated platform for corrosion management professionals; • A common language and structure needed to ensure communication throughout all levels of an organization; • A straightforward way for companies to identify gaps in processes that could lead to the reduced lifecycle of assets due to mechanical, integrity or human error; • A Corrosion Management Maturity Model that creates a roadmap of ac- tivities, investments, and best prac- tices that lead to higher performance; • A Corrosion Management System Framework, which is an organiza- tional structure that enables effective corrosion mitigation while providing a positivereturn on investment; and • A reference library to manage know- ledge and information collected through all components of the portal. 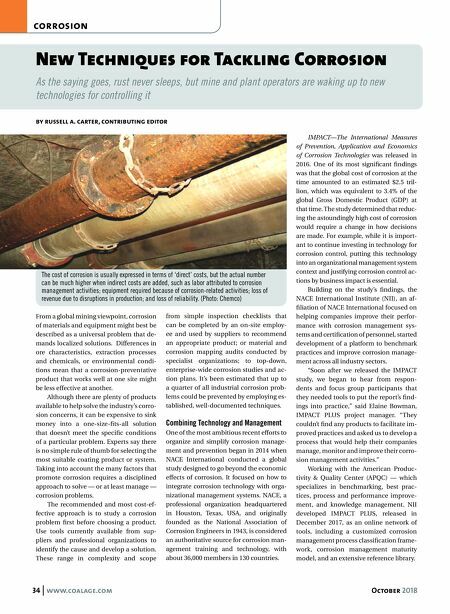 Going Digital Other companies are pursuing digital solutions for controlling corrosion, of- fering solutions largely drawn from tech- nologies used in the petroleum/gas sec- tor where corrosion can lead to disaster. For example, Accenture offers "digitally enabled" corrosion management ser- vices and solutions that employ a three- pronged approach involving IoT, data visualization and advanced analytics to help companies achieve optimum asset value several different ways. This includes through increased certainty of zones/lines at risk; reduced scope and frequency of inspections; reduced cost and asset down- time due to inspections; increased asset life; and improved worker safety. Accord- ing to Accenture, these improvements can provide a 10-20% reduction in inspection costs, 10% or more increase in uptime and productivity, and improved asset integrity, increasing asset life by more than 20%. Services available through Accenture's program include: • Risk-based inspection methodology; • Asset integrity division readiness; • System and data integration enabled by its Data Analysis and Processing Tool (ADAPT); • Image and video analytics to detect surface defects and signs of corrosion; • Advanced analytics and deep learn- ing using maintenance, design, oper- ations, environmental and historical data; • Real-time, interactive equipment monitoring by combining 3D model- ing with its Active Network Model for Corrosion Management; and • Digital inspection technologies, in- cluding nanotechnology, ultrasound, laser spectrometry and optical non-destructive testing. GE Inspection Technologies also said it is developing a family of corrosion management and inspection tools, with initial focus on corrosion monitoring. Its first product in this area is a predictive corrosion management application run- ning on GE's Predix platform and utilizing RightTrax PM ultrasonic sensors installed to provide coating-thickness monitoring. This approach, said GE, offers real-time thickness measurement and the ability to perform advanced data analytics and visu- alizations. It will allow users to move from point-in-time to continuous thickness measurement, and thus enable customers to improve asset integrity management while opening the door for innovative ways to utilize this data to optimize plant and process performance. Picking the Perfect Product A quick scan of the list of available cor- rosion-preventative coating types illus- trates the potential difficulty of selecting the right product for a specific problem. Common coatings, for example, include cross-linked or thermoset coatings, ep- oxy resins, polyurethane resins, alkyd res- ins, inorganic resins and thermoplastics, among others — and each of these cate- gories has certain benefits and application requirements. Specific products within each category may have their own subset of features, intended usage and targeted substrates. A few examples: Certain resin types such as polyvi- nylidene fluoride (PVDF) can be used in sprayable form or molded into various shapes and are now available in powder coatings that offer a new avenue for ac- cessing PVDF's ability to protect metal sub- strates used in mining and mineral process- ing from corrosion, abrasion and chemical attack. PVDF, according to suppliers, can succeed in applications where other types of materials such as fiberglass-reinforced plastic (FRP), elastomeric and urethane lin- ers have prematurely failed. Major chemi- cal companies such as Arkema and Solvay market their PVDF products under the brand names Kynar and Hylar, respectively. Another relatively new type of coating is chemically bonded phosphate ceram- ics or CBPCs. EonCoat is one of these — a spray-applied industrial coating that pre- vents rust on carbon steel. EonCoat "phos- phates" the steel to which it is applied, forming an amorphous magnesium iron phosphate layer. This layer, chemically bonded to the steel, is the first line of de- This diagram from NACE's IMPACT study illustrates the interaction between corrosion management systems (CMS) and other organizational management systems.